What can printed perfect bound books do for me? Putting content into perfect bound books is one of the best ways to present it in an appealing and professional manner. They are ideal for firms looking for a professional way of presenting their annual reports or providing training manuals to employees. They are also important outside of the workplace, for example for chefs to produce their first cook book, or among students looking to produce yearbooks to offer as a reminder of their academic careers. Many charities wanting to show where the money they raise is being put to good use find this product essential. They are also perfect to use for thesis printing to present your work in the best possible way. Aspiring authors or keen self publishers can also make use of Azimuth Print perfect bound books to produce the first run of their latest novel for distribution among friends and family, or to send on to publishers. Writing a book takes lots of hard work and time, but to publish it is lot easier thanks to Print on Demand at Azimuth Print. There are many publishing companies who can help you to publish your book, but if you just self publish you can keep 100% of the sales profits. If you print your book with us the final result will be stunning. Now, with the introduction of digital printing, it is possible to literally have just one copy of a book printed at a very reasonable cost. There are no printing plates involved, no conventional printing presses and no need for minimum runs of thousands of copies. We allow the printing of single books at per-book costs not much higher than those paid by publishing companies for large print runs. Read more about how to publish your book: Self Publishing a book is easy! Azimuth Print, the UK's premier perfect bound book printer offers an excellent, cheap perfect bound book printing service. 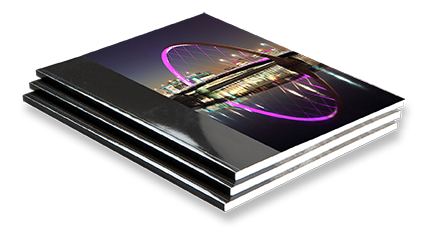 We can provide perfect bound books in three sizes, A6, A5, and A4 in portrait and landscape (excluding A4). Other bespoke sizes can also be produced. Our products feature full-colour softback covers printed on high-quality 300gsm Gloss paper, while the inner pages are produced using 100gsm Multicopy paper. You can choose the cover to be laminated for greater protection if you wish. Our perfect bound books contain between 64 and 500 pages in quantities ranging from one to 500, making them ideal for anyone wanting a one-off copy to a mass-produced run. You can either send us your own artwork or commission our designers to come up with a great look for your printed books for an extra charge. If you need to make small changes to your copy and design, we can take care of these at no extra cost, while larger amendments to your perfect bound book can also be made for a fee. PDF files should be supplied in the correct size (A6, A5 or A4). The inside pages should be supplied as 1 PDF in single pages in the running order you require. All fonts MUST be embedded. When designing the cover please allow at least 15mm of bleed beyond the trim size, please call us for the spine width when you know how many pages your book will contain. To find out more about the UK's premier perfect bound book printer, just get in touch for a quote or for answers to any questions you might have about our perfect bound book printing services.